The magnetometer was tested at the National Physical Laboratory of Kew, which also sent the instructions for use and special modules for the observations of oscillation, deviation and absolute declination. It seems that the Director of the time, Filippo Angelitti, intended to use this instrument to determinate the solar azimuth. The instrument is made of burnished brass, and has three legs with adjusting screws. The horizontal circle has a graduated nonius in 20”, accommodations for reading microscopes, bolts and a bubble level. Above the chamber for the suspended magnet stands a wooden box for the suspended magnet, with sliding wooden doors, and on the top of it are inserted a glass suspension tube and a thermometer to check the temperature of the magnet room. 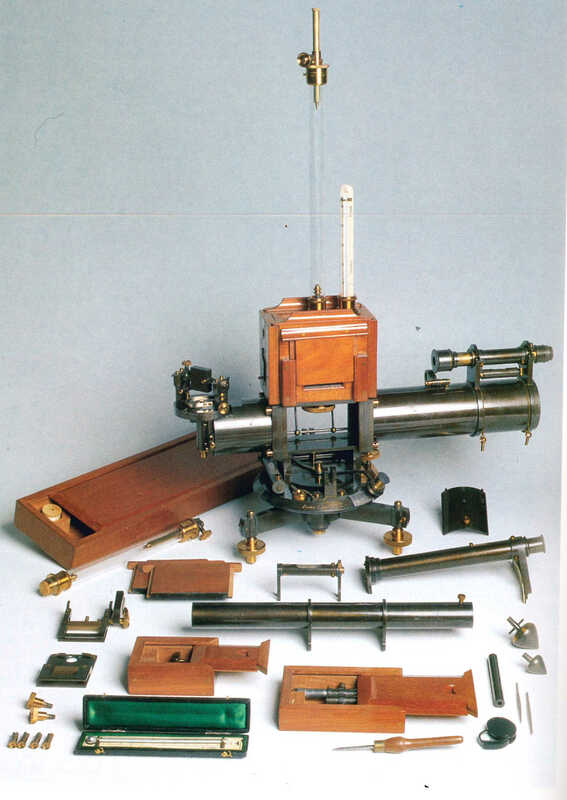 At the two sides of the box are, respectively, a small telescope, with rack and pinion focusing, bubble level and filters, and the mirror frame for solar observations, with its horizontal axis and screws on a plate. On the horizontal circle it is engraved the inscription: Dover Charlton Kent N.° 155. Bibl. : Foderà Serio, Chinnici 1997, p. 161.